Had a great re-union with Southern Cross IV and Virtue and Vice. It was brief but terrific to see them again. We met in Turks and Caicos and spent a lot of time with them in Luperon. 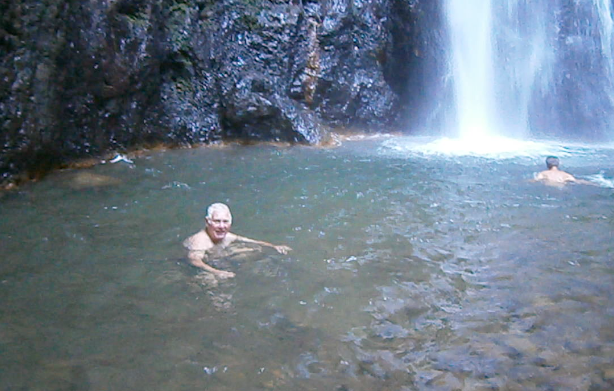 While we were weathered-in at Luperon we toured Puerto Plata, went over water falls and spent hours at Captain Steve's. Haven't seen them for 3 seasons. Really great couples sharing similar adventures. We didn't get much time with them but we are hoping for more time when we head back down south. Cheers! Left over cava from Isabella and Andy's daughter's wedding in Grenada. Shane and Micky - Shane's the vice, we're sure!